Another holiday recipe that I never cared for a child are candied yams. They were way too sweet and coupled with marshmallows is just too bizarre. Typically, we just cook yams like baked potatoes and call it good, but last Thanksgiving I discovered this recipe my children adored. Once the water begins to boil again (about four minutes), remove from heat and rinse in cold water. Cover with foil and bake for 20 minutes until the yams are almost tender. Sprinkle pecan mixture over the top of the yams and bake for 15 more minutes uncovered. In a pinch, I have substituted walnuts for the pecans, and this recipe is still delicious. Yum! That one sounds so good! We love to eat yams/sweet potatoes a lot in the fall and winter. I am hoping I’ll get a chance to make this soon. We’re going for a non-traditional vegetarian holiday this year: lasagna! My family has used a similar recipe for nearly 25 years. 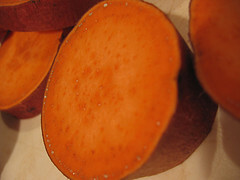 I bake several large sweet potatoes and when they are cool, scoop the beautiful carmelized yumminess into a mixing bowl. I add 1-2 eggs, brown sugar, butter, orange peel, and vanilla. I make the crumble topping as you suggested and bake the casserole for about 30-40 minutes. I only use sugar in the topping as the sweet potatoes become so sweet from the baking process. I prefer a chunky mixture, but another family friend makes a custard-like version by adding milk to the mixture. Tip o' the Day: Clean the Lint Trap on Your Dryer and Save Energy!